I had the panda reserve and Leshan tour with Victor. He is very knowledgeable and his English is excellent. It was a fun day for me. I learned a lot about the history of Chengdu and the places we visited. Watch out for his panda questions! They can be tricky :) I highly recommend Victor for anyone who will visit Chengdu. Victor was an excellent guide. His English was great. He is very knowledgeable about everything we saw. He made it a great tour. I would highly recommend Victor to others and would use him again. We did a private day tour to the Panda base and Leshan Buddha with Victor. It was a great day out. He was enthusiastic and knowledgeable. He answered all our questions. We went to a local restaurant in Leshan for lunch and had a delicious meal at Victors recommendation. It was an amazing tour and I highly recommend it to anyone visiting Chengdu. Wenhao "Victor" provided a tour of a lifetime, of course the pandas helped too! We had a wonderful time, he is a very professional and friendly guide providing lots of useful information as we traveled to the Panda facility and the sitting Buddha. His background working at the wild Panda reserve allowed him to provide insights that other guides could not. Also he is an excellent driver and the restaurant that he selected for lunch was wonderful. We recommend him very highly! TOUR GUIDE RESPONSE: Thank you so much for the review! It is always my honor to show you around my hometown! Victor was a wonderful Tour Guide. He was considerate, punctual, caring and most of all very knowledgeable. Victor taught me alot about the wonderful cities of Chengdu and Leshan. I would highly recommend Victor to anyone wanting to have a great travelling experience in Chengdu. The Pandas were amazing and at one stage, Victor and myself were alone with a Giant Panda, as Victor knows when and where are the best time for viewing. Victor was an excellent guide explaining everything in very clear English., very knowledgeable, took us to a nice local restaurant. The BMW car was very comfortable. An excellen day. TOUR GUIDE RESPONSE: Thank you Neil! It was my pleasure to work with your family! The kids are adorable! I'd highly recommend Victor's tour to all. Being extremely short on time, i was able to book my tour just the day before i wanted to head out. He met me in the hotel foyer at the planned time and we drove out to the Pandas, and then the Giant Buddha in his modern and comfortable car. He possesses an excellent level of English, and is highly knowledgeable in not only both attractions, but also the history of Chengdu. The driving distance was barely noticable with great conversation had along the way. TOUR GUIDE RESPONSE: Thank you very much! Michael. I am so sorry for my late reply. Just been busy in these days. Wenhao was an excellent guide, flexible and helpful. The itinerary was also well paced and structured. Xie xie! TOUR GUIDE RESPONSE: Thank you very much Darrell. It was my pleasure to meet you in Chengdu. I wish I could see you again! TOUR GUIDE RESPONSE: Hi Rob, thanks very much for the reviews! Victor was an excellent guide. Excellent English. His car and person were immaculate and he drives very well. He was punctual and ensured we saw the pandas in the best way, early and not over crowded. Lunch was excellent, he took us to a local place and he ensured that we got the best spot on the boat to see Dafo (Giant Buddha) in Le Shan, even telling us about the trick to get people to pay for photos! Thank you for a hassle free day. TOUR GUIDE RESPONSE: Hi Layinka,thanks very much for the reviews! It was my pleasant to spend that day with you! Good luck! TOUR GUIDE RESPONSE: Thank you very much for the review. By the way, my name is Victor but not Vincent. Victor is amazing! He is so knowledgeable and experienced. During that day we not only saw the beautiful cute pandas and magnificent buddha, but also learn ed the city of Chengdu, panda bases and the city of Leshan. TOUR GUIDE RESPONSE: Thank you very much for the review. Victor is a GREAT tour guide! 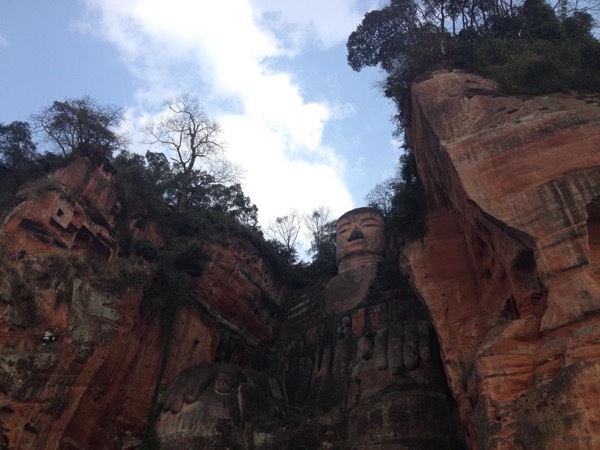 We did a 1 day tour of Giant Panda + Leshan Giant Buddha. Victor is very knowledgeable about the Pandas, and pointed out great photo spots for me. On the drive to Leshan, he pointed out local interest spots that might otherwise go unnoticed by touring groups. Before boarding the boat to see the Giant Buddha, Victor also walked us through a local market as well - very interesting! His English is exceptional, he is honest & professional, - you will greatly enjoy your tour! A++! TOUR GUIDE RESPONSE: Thank you very much, Sue! Welcome you back Chengdu one day! Great tour. Exactly what we wanted. Thank you! TOUR GUIDE RESPONSE: Hi Mike, thank you for the review! It was very nice to meet you!